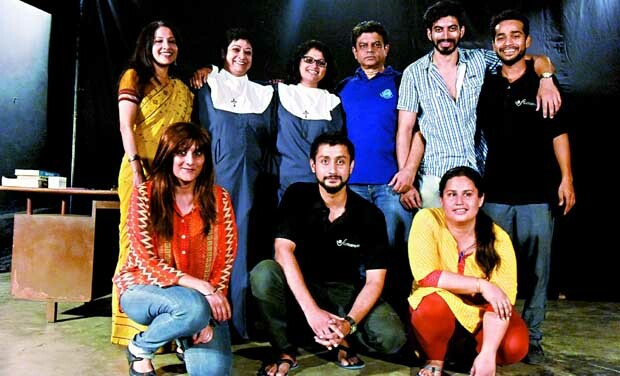 The cast and crew of Agnes of God, which was staged in the city on Friday and Saturday. The play got a standing ovation from the audience. It’s not every day that a play runs parallel to a protest outside by those seeking its ban. On Friday at Lamakaan, it was Sutradhar’s riskiest venture yet, the controversial play Agnes of God. The play tells the story of 21-year-old Agnes, a nun who delivers a baby under some very mysterious circumstances. There’s also the mother superior who wants to protect the young nun and a psychiatrist who doesn’t believe in religion. And Sutradhar pulled it off, giving the play its humanity. “It’s about this young nun who suffered mental trauma and who has no idea what is happening to her,” says Shayantoni Ghosh, who played Agnes. But make no mistake, Agnes of God has been in troubled waters. In Mumbai, groups sent out warnings but the actors here in Hyderabad chose to go ahead. “We rehearsed for over four months now and if someone tries to act smart, you think we’ll buckle down? No way. We also had support from all over — the theatre community, several Catholic organisations and people like Flavia Agnes, Father John Dayal, Brinelle d’Souza etc. and finally the police and Lamakaan,” says Vinay Varma, foun-der of Sutradhar. There were also texts flying between organisers and certain groups. “I got a call from one Joseph Dias from Mumbai, who asked me if I was going ahead with the play and I said yes. The conversation wasn’t exactly cordial and he subsequently followed up with a text which read, ‘Pl call back. We intend to file a criminal case here’. The Birla authorities however, got email threats of legal action if they went ahead with allowing us the space for Agnes of God and they cancelled,” adds Vinay. Overall, Agnes of God had something to offer to all. But probably one of the best moments from the play was seeing different communities of people coming together to make sure the play was staged without trouble. And in today’s times, that is nothing short of an absolute miracle.